KATHMANDU, July 1: The government’s bid to endorse the National Medical Education Substitution Bill through a fast-track process failed after the main opposition party, Nepali Congress (NC), threatened to obstruct the parliament on Sunday. Going against the agreements reached with agitating Dr Govinda KC, crusader for medical education reforms, the government had tabled the substitution bill in parliament with a plan to endorse it through a fast-track process. Some of the clauses of the parliamentary regulations were suspended for the purpose. As the NC threatened to obstruct parliament, Education Minister Giriraj Mani Pokharel held a meeting with NC leaders to solicit their support to endorse the bill. However, NC remained adamant in its stance saying that the substitution bill removes the fundamental issues incorporated in the ordinance introduced by the then government led by Sher Bahadur Deuba. The parliament meeting on Sunday was put off after there was no agreement between the ruling Nepal Communist Party (NCP) and the NC. The government now has two options — either convince the NC to suspend the parliamentary clauses to get the bill endorsed by Wednesday or introduce the bill through the normal process. Parliamentary sources said the government is likely to expedite the bill through normal process after Wednesday as the opposition party appears unlikely to give its nod to suspend the clauses of Parliamentary Regulations unless the government heeds the demand to introduce the Medical Education Ordinance without any changes. The main opposition party, NC, has taken strong exception to the bill alleging that it seeks to benefit only the CPN leaders and cadres who have huge investments in the medical sector. For instance, the proposed bill if endorsed will pave the way for two medical colleges — Manamohan Memorial College and Teaching Hospital, which has investments of the erstwhile CPN-UML leaders and B&C Medical College, which has investments of the erstwhile Maoist Center leaders — to start their operation as teaching hospital even without meeting the basic criteria. The proposed bill makes it easier to get affiliations to run medical colleges including in the Kathmandu Valley that already has many such colleges, allow new issuance of Expressions of Interest (EoI) to start medical college even without setting up a hospital and has scrapped the provision requiring public medical colleges to allocate 75 percent seats under free scholarship. These provisions not only go against the agreements reached with Dr Govinda KC, who has launched his 15th fast-unto-death in Jumla to implement the agreements, but also the recommendations made by Kedar Bhakta Mathema-led taskforce. Speaking in parliament on Sunday, NC lawmaker Gagan Thapa alleged that the government had introduced the bill after removing many important clauses to allow party-affiliated bourgeoisie and capitalists to open new medical colleges and make a killing. 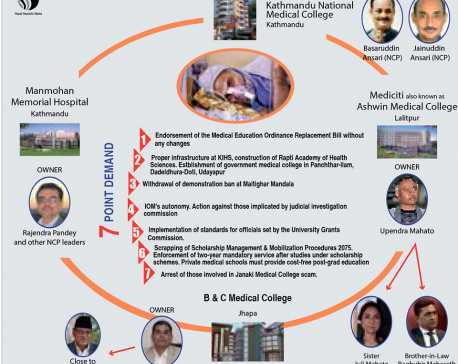 Expressing strong exception to the provisions incorporated in the Medical Education Bill, Thapa said the bill aims to benefit those with political interests rather than the medical education sector as a whole. He also alleged that the government with an ill-intention attempted to prevent Dr Govinda KC from staging peaceful protests. Thapa argued that the demands of Dr KC such as opening medical colleges in places where there are no medical colleges yet, a 10-year moratorium on the issuance of affiliation to new medical colleges in Kathmandu Valley, and providing free-of-cost medical education to deserving students from poor financial backgrounds are important for bringing reforms in the medical sector. Thapa alleged that the bill was introduced under pressure from NCP chairmen duo KP Oli and Pushpa Kamal Dahal, who were photographed dining at the residence of a controversial businessman during their unification process. “[You all are] Welcome to Prime Minister Oli’s bourgeoisie socialism,” Thapa said in a satirical note.